The hollandaise sauce with this recipe may be prepared in advance and, according to my mother, cannot fail. You can make it up to a day ahead of time, refrigerate and reheat gently when ready to serve. 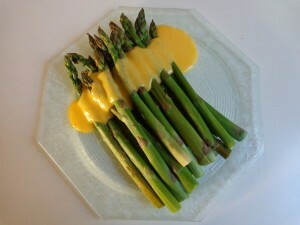 The best approach, however, is to make the sauce just before steaming the asparagus. In France, white and violet asparagus are highly prized varieties and are often served with hollandaise. But in addition to the flavor, which is not to everyone’s taste, the spears must be peeled before cooking. For this reason, green asparagus — which does not need peeling unless the spears are very fat — is the first choice of of an everyday chef. First, make the hollandaise. This recipe makes about a cup of sauce. In a bowl, whisk the egg yolks until well-blended, about 20 seconds. Add the salt. Melt the butter in a small saucepan. In a second small saucepan, heat the lemon juice to lukewarm. In a third saucepan, heat a small quantity of water to boiling. Begin adding the melted butter to the yolks, teaspoonful by teaspoonful, whisking constantly. When the sauce begins to thicken, add a few drops of the lemon juice. Continue in this way until all the butter and juice have been incorporated. Stir in the boiling water. Grind in some pepper and check the flavorings, adding more salt if necessary. If serving within the hour, place the bowl in a warm place, for example beside the stove. If serving later, place the sauce in the fridge. Before serving, heat an inch (5 cm) of water to lukewarm in a large pot. Turn off the heat. Place the bowl of sauce in the pot, taking care not to get any water into the bowl, and stir the sauce occasionally until it has softened. Be careful: if the water is too hot, the sauce will curdle. Now wash the asparagus and slice off the ends, leaving spears of 6-8 inches. Just before serving, place the asparagus in a steamer over boiling water and cook for 3 to 5 minutes, depending on the thickness of the spears. The aspargus should be just tender, with perhaps a hint of crunchiness remaining. Serve warm with the hollandaise sauce. Serves 4.